The launch of a new product is always a happy and exciting moment.. a lot of thought, energy and time goes into each stage of the development and production. To hold a finished product for the first time, is truly a magical moment. I have been longing to bring out a custom made insert for Picotin bags for a very long time, but due to its particular shape, it was never going to be a straightforward process. The project really only began to come together last year, when I found an atelier that had the necessary dedication, skill, experience and innovative techniques to help me make my dream come true. It is a french family business, and they are also the nicest and most wonderful people one could ever hope to work with. 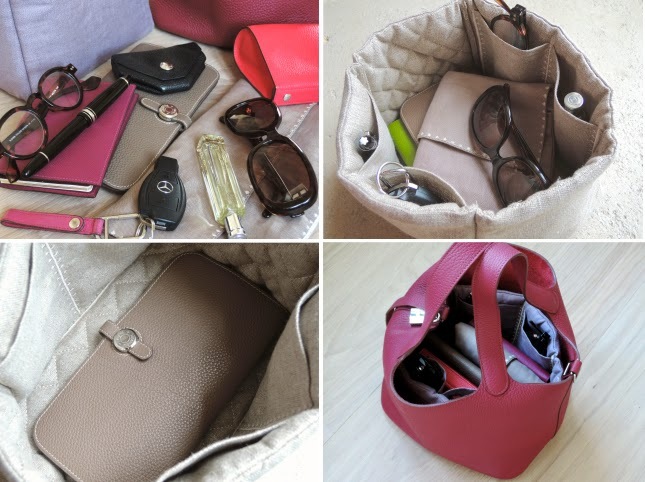 The insert had to fulfil various needs... help you organise the contents of your bag, protect the leather inside, and most importantly keep the bag in shape, whether it is used or stored empty. Above all, it had to follow the Picotin's destinct form, where a rectangular base evolves into a soft round opening. Picotin bags have no lining, and are therefore apt to loose their shape over time, or when empty. The insert had therefore to be strong enough to support the bag's structure, while allowing it to maintain it's soft lines, which is so much part of the Picotin's relaxed and easy chic. The MaiTai Collection Picotin inserts are made in France, from highest quality French linen. They are sewn inside out, which results in smooth and inward facing corners and seams. All edges are rounded, so there aren't any pressure points which could mark the leather of the bag. The four beautifully embroidered interior pockets give quick access to small items, such as keys, glasses, a pen or cell phone (the pockets are wide enough to accommodate an iPhone/smartphone). The base is long enough to store your wallet flat (Azap, Dogon, Béarn and Evelyne, or any other wallet up to 21.5 cm length). 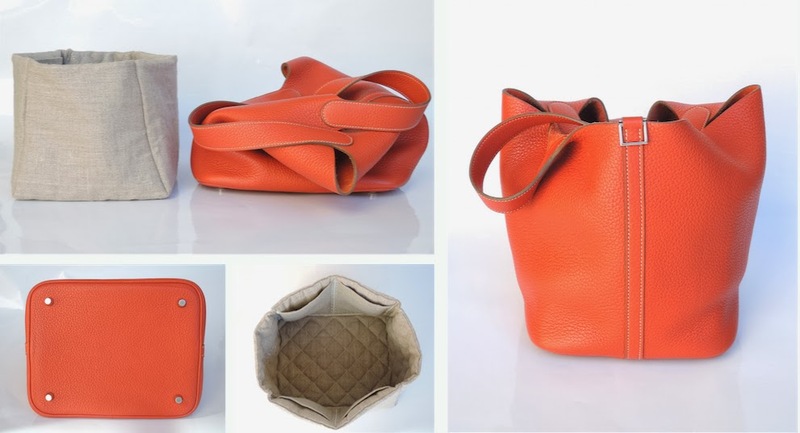 Apart from holding the bag in shape and letting you organise the contents, the insert also protects the inside of your bag from dust and dirt, pencil marks or whatever mishap could stain the inside leather. The perfect balance of firmness and softness also make it ideal for keeping the bag in shape if not used, or in storage. Instead of filling it with air cushions etc, simply leave the insert in the bag instead. At the moment, the insert exists for the medium size Picotin (MM in France, or size 22) only. what a wonderful and pretty idea. And it is much easier to find something in the bag. I wish you all the best with your new beautiful item! How do I order the bag insert for the Picotin size 26? Ah, yes my dear, there are...thank you! Great invention Maitai! I have an Evelyne which also has no liner. It's low profile (not wide in depth) so it suits my lifestyle but I always worry about the inside and the shape. Perhaps you can work you magic on this bag? By the way, great score from the Ines collection on your last post. She is so classic! So are you MaiTai! We love your style. Perfect!! I am so getting one for my Picotin! Hope they'll be best friends soon! Hands down to your endless creativity! You are truly presenting us the items we very much need and which are not available at the market. (Mostly, we take as given that some things "will continue as always", our bags are without proper inserts, the pillows are not proper, but anyhow, nothing better than that...). You will soon be able to open a nice brick-and-mortar store. Sweetly decorated, with beautiful items. Congrats! Genius idea yet again MT! I have just placed my order. I have been thinking for ages what I need an organizer for my Picotin! Thank you! Hope your organizer will be with you soon. Thanks so much again! This so makes me want a picotin! Wow, what a beautiful product! The quilting and embroidery are beautiful. Looking forward to seeing the other styles you come up with and hoping one with work with some of my bags. I couldn’t be happier with it either! This is just what I need for my etoupe Pico! I ordered one straight away! Thank you! Many thanks again, hope your package will be arriving soon! Fabulous. Love a bit of organisation. How clever:).i hope there will be a gm size soon for my rubis picotin! Wonderful idea if I could find a Picotin. It's very useful and niice. unfortunately we leave again for next week but not for Paris where eventually i would find a Picotin. In Geneva they say impossible to get one since more than one year, in BCN neither....and in Cannes they dont have it neither! I finish to accept the idea to live without it! But your idea is really exllent dear MT. Crossing my fingers for you, dear Monica. Hope you’ll find a Picotin one day soon! Perfection in the form of a bag insert , it all has your hallmark attention to detail and elegance .dear MaiTai. Thanks so much, my dearest Manuela! The inserts are beaming with joy after hearing your lovely compliments! Such an excellent idea, the Picotin is great bag for summer, this solves a lll of its glitches. Agreed, the relaxed chic is perfect for summer! Oooolalalala (she says, clicking her heels) I can't wait until the GM's are ready! (Alas, my two Picotins are GM) Dearest MaiTai your talent and creativity are truly a wonder. Please tell me that you'll be designing one for the Bolide and Birkin? I particularly like this because I tend to have my little Boston Terrier with me. The pockets make a handy place to stash treats, or a folded leash. Fenway (my dog) thanks you too! This is wonderful dear Mai Tai, you are such an entrepreneur. You see an need and take the trouble and effort to fix it in the most delightful and stylish way. This makes me want to rush out and buy a Picotin, just to get so nicely organized. Congratulations on another new line. You are so kind, many thanks dear Melissa (hope the ribbon solution worked out)! Awww, this makes me sad that I gave up my Picotin. The organizer looks great. I love the quilting and the lovely embroidery and the fact that there are just enough organizing pockets to make it really useful. And . . . not a bit of nasty Velcro in sight! I am sincerely stunned by your inventivity and creativity: What a great idea! It looks super well made as well! I don't have a Picotin but I would otherwise defo be a customer. What fabulous entrepreneurship: I really hope this'll be a popular item. I also greatly appreciate the fact that a french family business that holds quality in great regards has been chosen for this new product. Well done! I vote for Maitai au "Redressement Productif"! Thanks so much for the good wishes and fun&fab vote, dear Béatrice! I am so lucky with the atelier, without their expertise the inserts would still be just a dream! Such a refined and very practical purse organizer - much nicer than the plastic ones! I will be ordering one soon for my two MM's.! Please keep these wonderful products coming. So glad you like them, many thanks Maria! Ingenius! What can I say...you are so creative and stylish. Am a big fan of your products, although still have to wait a little as I still keep my nice clothes and accessories away from my 1.5 year old. :-). Hello Chantal, so nice of you to say. And your little one will be a big boy in no time! This is a beautiful insert, will you be making them for the PM size as well? I am queuing up my MaiTai Collection wishlist! congratulations on your new creation! Such a beautiful and smart idea! I am now taking orders from my friend, perhaps will order couple for my two picotins! I ordered one as soon as I read this! Please consider making them for GM and TGM Picotins, too. Many thanks again! A GM insert is coming soon. TGM is trickier as I need access to the bag and don’t know anyone who owns it..
Merci, Liss. And yes, Ines rocks! Excellent addition to the MaiTai Collection, dear! Well done. :-) I noticed that the care instructions specify dry cleaning, but I was wondering what maintains the structure of the insert? I imagine that there is batting of some sort, but I am wondering is there is cardboard or plastic inside as well? I pose this question because I try to avoid items that need dry cleaning for chemical reasons, which are used by all of the cleaners in my area. Items that I have dry cleaned usually require a longer trip into the city at a "green" dry cleaner. So, I am wondering if there is anything inside the inset that could break down, or cause it to lose shape by a gentle hand wash? Warm orange hugs, and a toast to your new creation! Ich habe eine Victoria und eine Garden und würde mich über ein passendes Teil hierfür freuen. Ich denke, dass der oben gezeigte nicht passt da er zu breit ist? Und die von H sind so extrem teuer. Ich bin jedenfalls gespannt auf den nächsten Gegenstand den du uns hier präsentierst! Ich wünsche Dir viel Glück bei der Picotin Suche! Für die Garden ist das bald erhältliche Birkini-Insert ideal, ich habe es heute gerade ausprobiert! Bei der Victoria ist es etwas schwieriger, denn ich besitze (noch!) keine! Birkini Insert! Es scheint als ob die Frühlingssonne mir Strandbilder in den Kopf gesetzt hat! ;-) Ich meinte natürlich Birkin Insert. I would love to have one for my small picotins!! This would be a great solution to the slouch. I will hopefully get started on the PMs soon! Toute personne qui possede un picotin devrais avoir votre enveloppe d interieur car c est une grande idée BRAVO! J adorerai sa pour pour mon garden ou mon evelyne se serais merveilleux .Encore bravo pour votre idée et pour la beauté de cet element qui est très beau. Congratulations, dear MaiTai, on what appears to be the successful launch of yet another wonderful product. I do hope that you will be adding a similar organizer/insert for the Bolide 31... ASAP! The quality of your products is exceptional (I have your scarf rings), and this is a wonderful extension of the signature elegance and refinement that are the hallmark of your brand. Well done! Congratulations on your new product! Organizer insert for Picotin MM is somothing that I have been wanted. I recieved one in Aubergine yesterday. I did not know what color Aubergine was exactly when I placed my order. It came out more beautiful than I had expected. On my PC, Aubergine looked like dark grey. But it is more like dark brown and also it has little blue shade, chic and beautiful color. It is soft but dark color, so I don't have to be worried about stains. It has 4 pockets, so I can put my iphone and folded type mobile phone ( I carry both) and parking card etc... The best point is that it keeps the shape of Picotin which is made soft leather and getting loose in shape after using a lot. Your amazing creation is so practical.Thank you so much. So happy you are pleased with the organizer insert, thanks so much for the lovely feedback! You described the Auberine color perfectly, and you are right... the pictures don't do it justice. I've tried so many times to capture the shade, but don't seem to manage! Have a wonderful remaining spring, and a very happy Easter! Please forgive this late reply dear Jane, I only saw your lovely message now! I am not familiar with the dimensions of the market bag, but if you'd email them to me, I will check against the insert. (maitaicollection@orange.com). Thanks so much. I received mine and it is lovely! Thank you so much MaiTai! So happy you are pleased, thanks so much dear Nest Girl! Dear MaiTai, just ordered one for use in my GM Picotin Bag! Thank you so much for your innovative idea. I had been hoping to find an organizer bag in bad for my Picotin and happened to see your blog and immediately ordered it. Many thanks, dear Jaslyn, so happy you found my site! Hope your insert will be with you soon, and wishing you much fun and enjoyment with it! Great idea! Do you think you can get one made for hermes bolide as well? What an amazing idea these are. I scrolled through the comments and noticed you haven't commented on the status of the PM size since April... is there any update on this? I would love to order one! Thanks! Hi, thank you for the nice comment! I am ready to roll with the insert, only that I can not find a PM Picotin at the moment (I check all prototypes with the actual bags to make sure they are a perfect fit). I am interested in the Picotin insert? How much for size MM and GM? Able to courier to Hong Kong? How long it takes to complete the order?